Road trips are fun, especially when the kids are happily occupied. Electronics are a lifesaver but shouldn’t be relied on all of the time. It’s nice when kids choose something else to do, on their own, without constant nagging from the front seat. Here are some great ideas for long car rides with kids. What do your children enjoy doing? What is something they might enjoy that could also enhance their learning? They can be having fun playing as well as learning. There are so many simple, inexpensive ways to keep kids occupied in the car. Best of all, they don’t take up a lot of space. Depending on the age of your child, these ideas are sure to entertain in the car. Everyone can benefit from this quality time. Here’s what to do with younger kids in the car and older kids on long car rides. It’s incredible how a simple fidget cube and spinner can occupy kids. My children bring these with them in the car, no matter how short or long the car ride. They are small and inexpensive, and one of their go-to toys for long car rides. Get younger kids learning to tell time by teaching them the time on the hour and half hour. See the small plastic clock here. It’s easy to move the hands to the exact minute you want, and it’s only 5″ so it’s easy to keep in the car. This clock can be great practice for older kids as well to reinforce concepts. Have your kids be the teacher and ask you questions as well. There are even telling-time flash cards. Use a tennis shoe one of the kids is wearing and teach your kids how to tie their shoes. Another option is lacing up a cardboard or construction paper “shoe” for them to practice tying. My son’s kindergarten teacher gave them one for over the summer to practice tying laces. It’s great for something different to do in the car. There are several varieties of this awesome game, all which will pass time in the car. 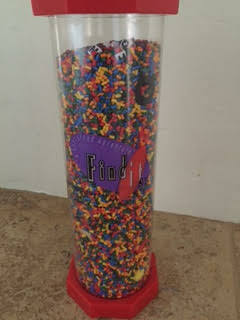 Kids will have fun finding all the objects in the tube (the Find It pictured has 23 things to find). The penny is all versions is meant to be near impossible to find, providing hours of entertainment. There are beach, dinosaur, sports, pirates, pets, Elf on the Shelf, wildlife, and more. There is even a Discover America version… perfect for road trips! The new version of this game includes cards to play the game (don’t bring in the car); the original version didn’t. On the original what you were trying to find was printed on the top of the toy and also was on a tear-off notepad. Kids won’t even realize they are learning all about nouns, adjectives, verbs, adverbs as well as encouraging reading and creativity. Use these to teach as well as reinforcing their knowledge. It’s great fun for kids to ask the adults the questions, write the answers, and get the laughs when they read them aloud. They get reading aloud practice, writing practice, they learn more about tenses and grammar, all while having fun. There’s even a Mad Libs on the Road book. We just bought Diary of a Wimpy Kid Mad Libs for our upcoming trip. There are lots of choices of Mad Libs. Plastic card collection boxes are great to keep cards safe. 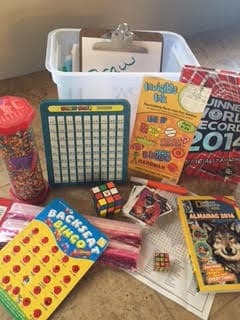 Kids can put their box on their lap and sort and play. 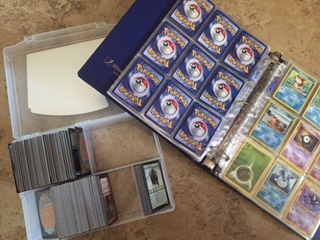 Or if they have some cards, they can spend their car ride putting them into plastic sleeves and into binders. My kids bought some cards at a visitor’s center at the World’s Largest Ball of Stamps in Nebraska and enjoyed playing with them in the car for hours. If you aren’t familiar with these summer workbooks, you are missing out (click here for examples). They are excellent books that are intended for summer breaks from school to prevent summer slide. There are two pages each day for your child to complete. It is very “do-able” for even the most resistant child. 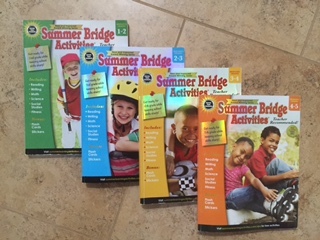 If your child just finished second grade, buy the bridging grades 2 to 3. If you have a fourth grader going into fifth, buy the 4 to 5. There are three sections, each with 20 days, for 60 days of learning and review. There’s reading comprehension, math, writing, grammar, social studies, science and some fitness all throughout the book. There’s a summer reading list included as well as pages and pages of sturdy flashcards at the back to cut out. They are great books that keep kids engaged without overwhelming them. It is also helpful to know what your kids may need some review with. These are good books to bring on long road trips because kids can do a little each day without feeling overwhelmed. Offer positive comments when you check their work and spend some time and even giving more examples of concepts they may be struggling with. It’s a timeless toy for a reason: It’s easy to tote and store, and it keeps kids occupied. 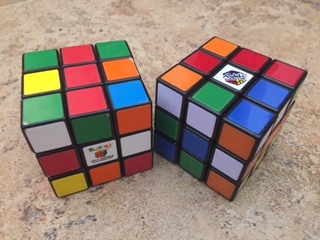 Rubik’s Cube helps work different parts of your child’s brain as he or she tries to make a side all the same color. Older kids can try to make two sides or more the same color. 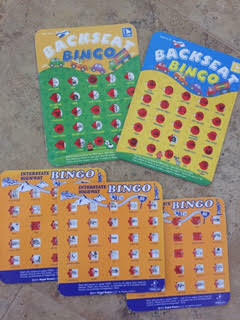 Travel bingo games are fun and easy to keep in the car. Even more fun is for kids to make up their own games, taking even more time in the car and encouraging them to use their imaginations. 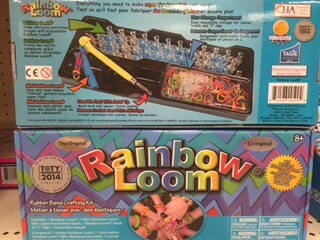 Remember how the Rainbow Loom was so popular? Bring it out for a road trip for some fun. Bendaroos are another fun creative outlet. Think of them like pipe cleaners but smaller and easier to make things with. Anything that keeps their mind and hands working will pass time in the car. It’s also great to continue building fine motor skills. Get a spiral bound, hard cover drawing pad, and your child will be set on the road. Another option is to keep a clipboard with some plain paper for writing or drawing. Keep it in the car during the school year for homework in the car. Colored pencils in a pouch and a regular pencil could be enough. Crayons or washable markers are a little more to deal with in the car but are also great. Whether or not you are headed to Legoland, your kids will enjoy the Lego Club magazine. There’s one for younger kids as well as for older Lego enthusiasts. Even if you don’t have a huge Lego fan, the magazines are entertaining. Not an iReader or a tablet. It’s great when kids can bring longer books and read on their own. What a sense of accomplishment to finish a longer book (or two) on a road trip. Do some thrift store shopping before you leave town and buy some books. You can drop them off at another one, like Goodwill, along the way and pick up some more for the return trip. Kids love the Guinness Book of World Records books and National Geographic Kids Almanac books. Kids love reading the facts and looking at the pictures. They’re great to get everyone talking. Yes & Know Invisible Ink games: Invisible Ink offer variety and fun. 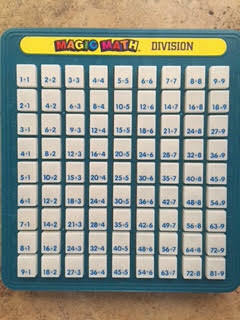 Math keyboards and math flash cards: The math keyboards are a great way for kids to learn the relationship between numbers with addition, subtraction, multiplication and division. Word searches: What are your kids interested in? Create your own word search online with something they love or something they need to learn like days of the week and months of the year. Fun ideas for long car rides include games everyone can play, including the driver. Everyone takes a turn naming a fruit, color, restaurant, etc. Older kids can have fun writing down all the states, states and their capitals, all the baseball or football teams, vegetables, etc. they can think of. Either taking turns or everyone on their own finds something that starts with A then a B then C, etc. Together as a family, try to see how many different state license plates you can find. Another fun game is to each try to find the alphabet on the plates, first finding A, then a B, etc. For another challenge, you can find the numbers. It gets tricky when you’re out of the single digits! Have your kids go tech-free in the car for a few hours each day. Your kids will interact more with tangible things to do and will benefit from conversations, reading, creativity, and play. They may well benefit from the downtime and learn to not always need to be stimulated and entertained with electronics. These ideas for long road trips with kids are sure to make your vacation more interesting. Tip: Keep a portable tote, preferably a standalone plastic tote with a lid, in the car to put stuff in for your kids. During the school year, a clipboard and small pencil box are staples so the kids can do homework on the go. Keep a pouch with colored pencils or crayons and some blank paper and kids can doodle and draw even for short trips. There are so many fun ideas for road trips that will engage and some that will get everyone interacting. Isn’t that was road trips are for, to encourage more family time as you make memories exploring new places? It’s easy to make it fun with these ideas for long car rides. Traveling with kids can be a lot of fun, but it can also be a challenge if you’re not ready. If you’re planning to go somewhere with the little ones, make sure you’re prepared and all the bases are covered. 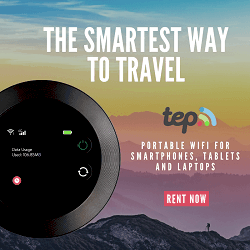 This guide offers tips for those occasions, and we have provided sections for traveling with children on planes, cars and trains, as those are different situations that necessitate unique approaches. sun block, swimsuits, toothbrush, bottled water, sunglasses, health snacks, entertainment (books, games, DVDs, toys), medication, motion sickness pills. pillows, blankets, cooler, paper towels, garbage bags and a first aid kit. There are a few other things you need to consider. First, prepare the checklist and pack as early as possible. There’s nothing more frustrating than trying to cram all the stuff you need in just a few days or hours. The earlier you plan, the less hassle it will be and the less likely you’ll forget something. Keep a list of the items you plan on bringing and if the list is too long, arrange them by priority and scratch out those you think are not important. Also when you’re packing a diaper bag, make sure that the lining is waterproof and that it’s got a shoulder strap for convenience. Packing extra shirts for the kids is a must, but bring some for yourself just in case. With regards to the kids’ clothes, pack them in one bag or section of your suitcase so it’s easy to find. It’s also a good idea to use re-sealable plastic bags so your medicines and toiletries don’t leak. If you’re going sightseeing, bring a good travel camera –and a charger- as that should keep the older kids occupied. When traveling with kids in a car, the first order of business is to make sure their car seat is installed properly, as an incorrectly configured car seat can lead to an accident. If this is a road trip and it’s hot, bring plenty of water for the kids and adults, and there should also be a first aid kit and a flashlight in case the car breaks down late at night. Speaking of cars breaking down, it’s a good idea to bring along an extra tire and all the necessary tools so you can get it fixed. Aside from ensuring your road assistance is updated, your smartphone needs to be fully charged so if there’s an emergency involving your kids, you can call someone. Sleep is very important for children, and for their sake –and yours- they must have a good night’s sleep prior to going on a trip. If you’re leaving before lunch, allow the kids to eat inside the car to keep them occupied. Another advantage is that after eating, toddlers usually go to sleep, giving you some peace and quiet. And while your child is sleeping, keep driving because the moment you stop he/she will wake. Know where the tourist attractions, parks, eateries and other tourist spots are so you can stop there and let the kids have some fun. This will make the long journey more enjoyable for them. To avoid spending too much time in a restaurant, bring along plenty of snacks like bagels, pretzels, sandwiches, bananas, cereals, potato chips and cookies. Avoid fruits for smaller kids as those tend to get messy, and yogurt treats require a spoon, but pack them in Bento LunchBoxes. And steer clear from juice boxes because odds are the kids will make a mess in the backseat. If you’re not going to do these long road trips often, it’s okay to relax the rule against junk food. Letting them indulge in some chocolate chips isn’t going to hurt, and having them enjoy those foods could translate into peace on the road. Traveling by train doesn’t have to be a pain, and one of the ways you can make it enjoyable is to let your child’s curiosity run. If it’s their first time for kids to ride a train, let them savor the experience, check the tracks, the arrivals, departures, watching trains come and go and so on. Also keep in mind that many train stations have colorful artwork displays that will keep kids entertained. During stop-offs, give the kids time to enjoy the surroundings. During the train ride you may consider bringing along some simple games and toys to keep them occupied. A good pack of cards or a puzzle will do nicely as well. Puzzle and mind games are ideal on trains since many have tables where you can put the stuff on. Limit the baggage you’re carrying, especially with kids’ entertainment. You don’t want them to get bored, but you also have to remember that you’re in a shared space with other passengers. Headphones are necessary, and for little kids, the over-the-head type is a better option. Just remind them the sound should not be set too loud (not good for the other passengers and their ears). If you don’t want young kids using a small music player that could get lost, just plug the headphone into a laptop so he/she can listen there. Toys and playthings should be small enough to pack inside a daypack. There’s no need to bring large toys, and the older ones will probably be too busy enjoying the scenery anyway. Encourage them to do so, and explain what they’re seeing as that will keep them occupied. Preparing for a flight with kids doesn’t have to be any more involved than going out on a train or car. To avoid hassles, prepare a list of the items you have to bring (bearing in mind the airline rules and regulations) and have all your papers in order. Double check the seating arrangements before you check in. If you’re traveling with a baby, ensure the bassinet has been reserved. If that’s not possible, sit as far back on the plane as possible so you’re near the bathroom, crucial when it comes to changing diapers. Ensure the kids are in shoes that are easy to get in and out of, but do ask security if it’s necessary because in some cases it isn’t. As you’re waiting for the flight, it’s okay to let the children walk around, as they’ll be doing a lot of sitting during the flight. Make sure all the kids use the bathroom prior to boarding. If you have a baby, change the diapers before boarding even if the diaper isn’t that dirty, as that will reduce the time you spend changing diapers in flight. As for toys, it’s sufficient to just give some crayons for children so they can draw. Each child should have their own pack so there’s no fighting over the colors. Of course you can give them other playthings, but avoid those that have lots of parts or those that require a lot of items to run. When on a plane, keep the toys simple and small, and usually a coloring book with crayons is enough to keep them happy. And as mentioned above if your kids are into books, bring a few light ones or if they’re old enough, an ebook reader app so they can read to their hearts’ content. During the takeoff and landing, the kids should have something to drink and the baby is nursing or drinking from a bottle. A good way to keep them distracted is to explain exactly what’s going on, and if they can see what’s happening in the window that’s even better. Once the plane lands, let the other passengers get off first. When it’s your turn, double check and make sure everything is right there. Put the baby in the carrier so you can hold the other kids. Traveling with kids can be quite the task even for parents that travel a lot, and you can never be sure how they’ll behave on the road. Carpool hacks – Once upon a time, my kids were babies and toddlers and their extra-curricular activities revolved around play dates and parks. They had no social lives to speak of, and we were able to walk or bike leisurely to most of their activities. Then they became school-aged, and before I knew quite what had happened, I found myself in the car, driving them to and from school, activities, sports, and lessons with alarming frequency. Even if you strive, as I do, not to over-schedule your kids, you probably find yourself playing the role of taxi driver all too often as well. I started thinking of carpool hacks and tips to help other parents. I became a carpool for kids expert… by necessity. With three kids in two different schools, all playing sports and taking various lessons, I had no choice but to collaborate with other parents. And I’m so glad I did: carpooling with kids saves us gas money and time, and reduces our environmental impact. Setting up (and troubleshooting) a carpool (or two or three) can be complicated, but it pays off when you’re able to stay home as often as four days out of five. Here are my best carpool hacks, learned by trial and error. It’s not the mob, but it’s still more difficult to get out of a car pool arrangement than you’d think, so choose carefully when reaching out to potential carpool partners. Obviously, you should trust the parents involved and know that they will enforce seat belt buckling and drive safely. But nearly as important is their reliability: is a potential carpool participant that mom who’s always late to everything? Or is it the parent who never seems to remember commitments? You don’t need that in your life. In addition, you need to consider the child’s or children’s behavior as well. It is stressful driving, and sometimes it is better to be alone (with your kids) than to wish you were alone (with your kids). Once you’ve made some selections and formed a group, make sure your kids are familiar with the parents involved before the carpool beings. My kids need to know who is in what I call their ‘circle of trust’: adults they know we’ve approved of as parents to drive them (in car pools). Side note: When it is an emergency and your child didn’t know about the change of pickup person, they should be given your family code and be advised to willingly give it to your child. In addition, your child should always feel safe to ask the code, even to a very familiar person. After using the family code, you need to change the family code. At many schools, forms are required for every adult approved to pick up your child. Once you’ve decided on a kids carpool group, share contact information at one time (a group email is a great place for this), so you can easily fill out forms without needing to call each participant. Who doesn’t love the convenience of texts? I start group texts for each of my car pools, which we use continually as questions or scheduling issues arise. For instance, if my child is home sick from school, it only takes one quick text (instead of multiple phone calls) to let everyone know. If texting doesn’t work for your group, consider group emails or a private Facebook group where messages can be exchanged. Rotating schedules (such as, ‘I pick up Monday, Wednesday, and Friday this week, then Tuesday and Thursday next week’) are the death of carpools. They’re just too hard to keep track of, once you add school holidays, sick days, and snow days to the equation. If possible, it’s better to have each parent responsible for a day of the week, and stick to it, even if that means not every day of the week is included. For example, I have a school pick-up carpool with four members. Because we don’t want to rotate for one day per week, we each have a day assigned for Monday, Tuesday, Thursday, and Friday, then everyone is responsible for his or her own children on Wednesday. This is easier to remember than alternating Wednesdays or worse, every day. Avoiding a rotating schedule may mean having fewer members in your car pool or having one member take two days. Another example: for a soccer pick-up that occurs two days per week, I prefer to have only two people in the carpool, instead of three. As a result, we each pick up more often, but no one has to remember which ‘week’ it is in the rotation. Trust me, this is preferable. Remember how many seats you have in your car! Have a school pick-up five times per week? It’s tempting to form a group of five parents. But if each of those families have 1-2 kids to pick up, do you have space? Make sure you have a seat belt for every member of the carpool, and are only counting available seats which are safe for the age of the child. For example, I have six available seats in my car, but only five for the elementary school carpool, where the kids are too young to sit in the front seat. Scenario: A carpool parent is not installing your child’s booster or car seat correctly, or it’s too difficult to provide one every day. Solution: If this is a long-term carpool, buy an extra car seat or booster seat to leave in the parent’s car permanently. When the carpool does end, you can always use this seat in Grandma’s car, or for travel. Scenario: Your child doesn’t get along with another child in the carpool. Solution: Kids don’t have to be best friends in order to survive a 10-minute drive together, but if there are serious problems between them, suggest a carpool hiatus. Your child should not have to be in a hostile environment every day, and he or she comes first. Scenario: A particular carpool parent is always late for pick-up or drop-off. Solution: Offer to trade days or times. Perhaps it’s too hard for him or her to get there on time due to another commitment. Even if this is not the case, offering to trade will alert the parent to your awareness of the problem in a non-confrontational manner. Being chronically late to an event or lesson causes stress to any child; like in the above scenario, your child and his or her well-being has to come first. Carpooling is a great way to save money, time, and the environment. Getting a carpool off the ground can be challenging, but these tips will help you overcome any carpool hurdles and set up a successful carpool for your kids. Using these carpool hacks and carpool advice in advance of setting up your carpool for kids will make for a less chaotic and stressful commuting experience for everyone. Plan to go green this summer and throughout the school year with these best carpool tips. Photo credit: daylmer and philscoville. Traveling with Kids: Should You Go Now or Wait? I’ve always been an advocate of taking the kids, whether your travels send you across the state or across the world. All parents know, however, that traveling with kids can be both rewarding and challenging. Deciding whether to bring them along or go solo is never simple. Determining when to travel with kids and when to wait depends on what type of vacation you’re seeking, the ages of your kids, and what you’re hoping to get out of your trip as a family. Who are you hoping to enrich by taking this journey: yourself and/or your spouse, or your kids? The answer is likely both, in which case it’s important to ensure your child or children have reached an age at which they can appreciate what they’ll see and do. A trip to Paris enriched with art and culture, for instance, can likely be absorbed by any aged child, whereas a vacation planned around Civil War battlefields or Washington, DC landmarks will be lost on children too young to have a frame of reference for their importance. Find travel ideas for kids by age to figure out when to take them where. Are you willing to adjust your itinerary to accommodate your kids? If your heart is set on touring the Vatican when you visit Rome, but you have a two-year-old who will only want to splash in courtyard fountains, you may want to save your time and money for when he or she is older. If, on the other hand, you don’t mind spending the majority of your time in Tuscany relaxing in a villa and riding bicycles, you may well have a near-perfect experience, toddler and all. Will time changes be a factor? If so, you will want to make sure your trip is long enough to give children plenty of time to adjust. Quick trips outside your time zone can be miserable for parents and children. Make sure you’re not resentful of time spent adjusting by planning several rest days on each end of the trip. Is this a once-in-a-lifetime vacation? If so, wait until everyone is old enough to not only enjoy the experience, but cart their own luggage, cut their own food, and entertain themselves en route. Once-in-a-lifetime trips carry big expectations: do all you can to ensure the kids and the adults will have a great time. We want to travel to Australia or Planning a Trip to London, for instance, but I know our family will get more out of the experience when the kids are all teens as opposed to now, when the youngest still has to struggle to keep up. They’re too young to remember it. Babies and toddlers may indeed be too young to remember a trip, but you’re not! Watching a child’s joy in the moment while touching snow for the first time, glimpsing a swallow in the eaves of a monastery, or tasting gelato at a street-side cafe will be a life-long memory — for you. When our oldest child was 13 months old, we took him to Mexico. He remembers nothing of it, but his father and I cherish memories of him dancing for the first time to mariachi music. Babies will go anywhere without complaint, and a trip with an infant really isn’t about them, is it? The benefits of traveling extensively with a baby are that you’ll groom them to be good travelers, and you’ll be able to follow an itinerary that’s all about you. That said, parenting demands can double on the go: if your infant doesn’t sleep well at home, he or she isn’t likely to abroad, either. Plan trips with babies with plenty of downtime and lodging that provides conveniences of home. Traveling with kids is a waste of money. Kids often stay, eat, and enter attractions for free or reduced cost. Apart from the cost of airfare, they may be the cheapest people in your travel party. Of course, there are souvenirs to buy! 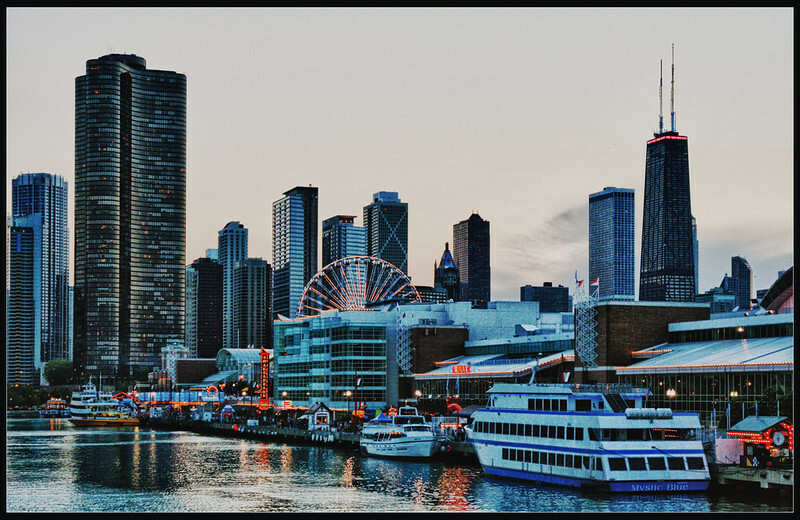 The City of Chicago is an amazing tourist destination filled with extensive park lands, a variety of tourist attractions, diverse neighborhoods, and fresh water. It is a multicultural city and is recognized as a passionate sports town within the United States. Chicago offers safety and security to its citizens along with affordable housing and a great environment. In Chicago, you can experience delicious dining, amazing accommodations, and world class attractions and entertainment. Chicago is also one of our Top Green Cities. The famous Sears Tower in Chicago was once the tallest building in the world. However, the building has still not lost its charm. For anyone who is planning to visit Chicago for the first time, the Sears tower cannot be missed. On the SkyDeck, you will be 1,454 feet high and will be able to view the entire city in all its glory. From Lake Michigan to even nearby states like Indiana, Michigan, and Wisconsin on a clear day, you will be able to see a great amount of things. You will also be able to learn how the building sways four feet in all directions when it is windy. Navy Pier is a city on its own within a city. Built on a stretch of 50 acres of land, the area comprises of restaurants, shopping malls, museums, gardens and parks, stages and various other attractions including a Ferris wheel which operates throughout the year. Navy Pier attracts millions of people all year round. 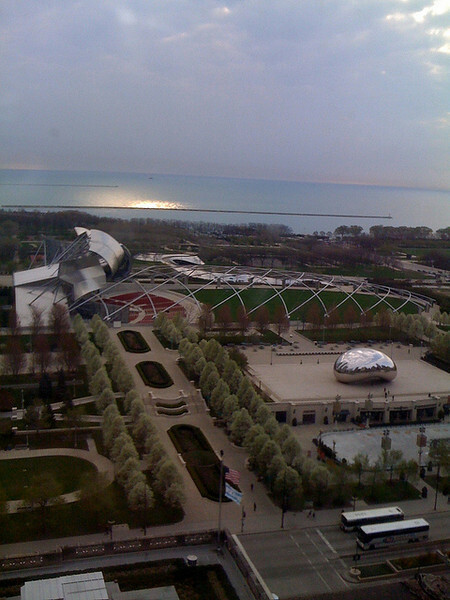 Millennium Park is one of the newest places and attractions of the city comprising of a lot of performances and free concerts all year round at the famous Jay Pritzker Pavilion. At Millennium Park, you can explore the vast garden and see the amazing sculpture famously known as The Bean. The Magnificent Mile is an ideal attraction for business people and tourists alike and proves that Chicago is a great city to visit. At the Magnificent Mile, you can start with the Michigan Avenue situated at the Chicago River, and then head up north for a one mile walk to Oak Street. During this visit, you can witness a lot of great architecture, fine dining, and great shopping experiences. 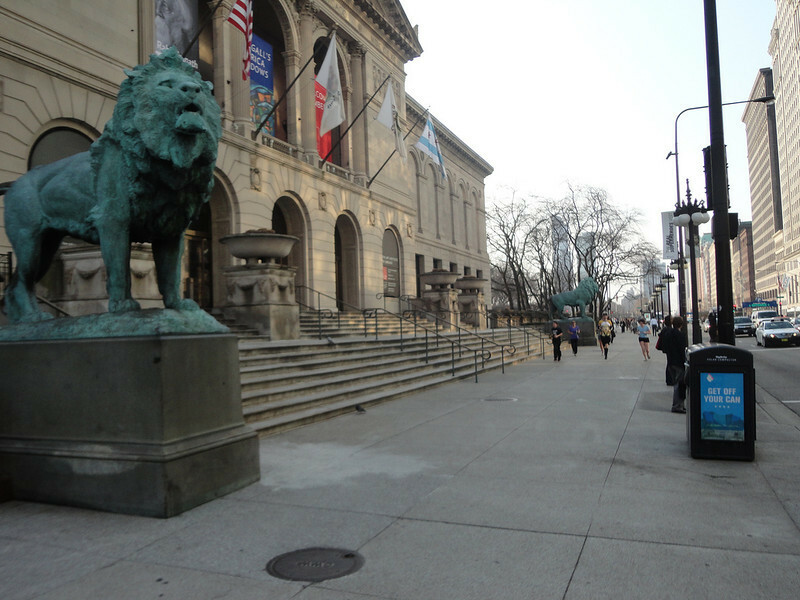 The Art Institute of Chicago is one of the main attractions of the city and is one of the most famous and reputable institutions around the globe. It features some of the most amazing artwork by van Gogh, Monet, Rembrandt, Renoir, and many others. With so many art collections by leading artists, the institute is home to work of not only this but of a variety of continents. The museum also has educational programs and guided tours which are specially designed for tourists. With so much to see and do in Chicago, you will only wish that you can stay in this magnificent city forever. 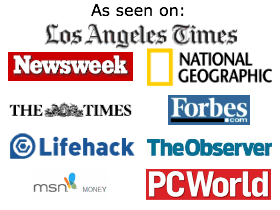 If you are planning a visit, you can simply not miss out on the attractions that were mentioned above. I also have to give an HIGH recommendation to the Chicago Legoland and Taste of Chicago Summer Fest. Learn about best Legoland Chicago tips — it’s in Schaumburg, IL. From Chicago, there are lots of cool road trips to take, including one to Iowa with kids and to Nebraska with kids. I wasn’t excited about tackling the 7-hour drive from Minneapolis to Chicago with a 4-month-old. I knew the car trip would take even longer than usual and that my son would get cranky being cooped up for so long. And it was a holiday weekend. What are some ways to make car travel with baby easier? The first few hours were rough. My screaming baby who refused to sleep and oh so many stops. But once we got into the road trip groove and learned a few tricks for keeping baby happy, the drive was actually sort of fun. Here’s what we did to keep our sanity and what we learned about car travel with baby. We filled up on gas and packed the car the day before we left, so we were able to hop in the car and go first thing in the morning. It saved us a lot of time. It made getting on the road less stressful. We left at 6:30 am and it was perfect. Baby was ready to sleep again by the time we got in the car, which helped our trip get off to a smooth start. If your baby is old enough to engage with toys and books, bring a bunch. At one point, we had out 5 books and 6 toys. He always preferred some books and toys over others so we rotated them throughout the drive. If your little one likes music, be prepared to sing your heart out, pop in a CD, or use your MP3 player. If you have two adults in the car, divide and conquer. One of you drives while the other plays with and soothes baby. There’s nothing worse than being trapped in the front seat, stuck in traffic, with an inconsolable baby just out reach in the back. Our son needed to eat every 3 hours so we knew we’d have to stop that often, but he got cranky after 2-2.5 hours so we stopped even more frequently to take him out of his car seat and let him stretch. Who could blame him for wanting a break from his car seat? The last thing you want is to be digging through a giant suitcase at a rest stop looking for more diapers. Pack smaller bags so you can find things easily, even if it means bringing more bags. We had separate bags for food, diapers and toys, computer and books, and parents’ items (wallet, phones, etc.). Don’t wait for baby to get hungry before you stop. A hysterical baby isn’t fun for anyone. You never know when a traffic jam will attack, keeping you on the highway when all you want to do is pull over. When we were stuck on a highway between Chicago and Madison, WI with no gas stations or rest stops in sight, our son started screaming. We thought we would hit a rest area before he needed to eat, but we were wrong. We ended up taking the next exit and driving 5 miles before stopping to feed and change him in a Menard’s parking lot. Not ideal. Plan on each stop taking 20-30 minutes. Allow time for the adults to take a bathroom break, grab food, and put gas in the car. This allows allows time for baby to eat, stretch, and get a diaper change. If you stop just to feed or change baby, inevitably one of the adults or other kids in your car is going to need a bathroom as soon as you start driving again. When you do stop, stop somewhere where all passengers can do everything they need to do. Run to the bathroom, get a meal, gas up, change baby, and feed baby. Our son started crying inconsolably, and we couldn’t figure out what was wrong. He’d just eaten, he had a clean diaper, and he’d slept recently. I felt him and realized he was sweating. He was only wearing a onesie and pants, but since he’s rear-facing, he wasn’t getting any of the A/C, and the light blanket I had draped over his car seat to block the sun was trapping heat. Once I stripped him down to his onesie and cranked up the A/C, he was a much happier baby. It’s amazing how quickly a 7 hour drive turns into 9 hour drive. All of the stops a baby requires definitely add up, so allow for extra time on your drive. Once you’ve arrived at your destination, you have to deal with a new environment and schedule for the baby, especially if you’re bunking with family or friends rather than staying at a hotel. And don’t forget that a few days after you arrive, you get to turn around and do it again on the ride home! But by then, you’ll have conquered the drive to your destination, and you’ll be a pro at traveling with a baby. If you plan ahead, are sensitive to your child’s needs in advance, and give him or her enough attention and stimulation, you should have a wonderful, relatively stress-free time experiencing car travel with a baby. Have you taken a road trip with a baby? What tips would you add for car travel with a baby? We’ve talked about eco-friendly apps, paper-free books, and even travel gadgets for kids. But what about green movies? Movies can be a fun way to educate kids about environmentalism and the importance of living a low-impact lifestyle. And since movies play a big role in keeping our kids entertained while we’re traveling, we try to make our screen time educational as well as entertaining while we’re on the go. Whether you’re looking for entertainment at home or on the road, here are our favorite top 5 green movies for kids. One of our all-time favorites, Hoot empowers kids to make a difference in local environmental issues, as it follows the story of a tween-aged boy and his friends, who take on developers in a fight to save a population of endangered owls. Best for school-age kids who can identify with the main characters, Hoot is appealing even to young kids who like to see a kid in the role of hero. Big Miracle will entertain parents as well as kids, so fire it up in the hotel — not the car — so you can see, too! Following the true story of three gray whales trapped under the ice in Barrow Alaska in 1988 (and the local community and world-wide media attention that sought to save them), Big Miracle teaches kids that nothing is black and white as big business, Native American Eskimo tribes, Greenpeace representatives, and even the then-Soviets all come together. Beware: There are sad parts. Perfect for preschool-age kids and up, The Lorax is a very kid-accessible take on what happens when we misuse our world’s resources. Read the Dr. Seuss book first to get the most out of it! Definitely for older kids and teens, Avatar will not only entertain and enthrall, but offer a poignant message on environmentalism, drawing parallels to industrialization, native people’s displacement throughout history, and scientific advancement. Not one for the younger set, Avatar certainly includes upsetting moments. Surprised to see a movie about race cars included in this list? Cars II not only entertains kids and adults with its clever theme of espionage, but puts the use of bio fuel into the spotlight. While watching Cars II, older kids can learn about the conflicts between environmentalism and big oil and big business. As an aside, I am always a big supporter of movies that are G and PG. So many times it seems that producers make what could be kid movies — a G or a PG — into a PG13 movie to attract a larger audience, and teenagers with more disposable income. When The Peanuts Movie came out, we couldn’t run fast enough to support it. Hopefully other production companies will follow suit. We are big supporters of G movies and safe family entertainment. I love that it has become part of pop culture to go green, recycle, and to use and consume less. Back in my day, we saved and bundled our newspapers for the Boy Scouts and returned our glass bottles to get our deposit back. We repurposed things out of sheer necessity, not for intentional repurposing. There wasn’t this buy and consume it now culture and easy access to buying things that we have now. It’s great for kids to learn about being green from a younger age. What are your favorite green movies for kids?